Hello and Happy Christmas Eve Eve!!! This card features the Bride & Groom Stamp which i coloured with my copics. The papers i used are by Echo Park and i added some ribbon & rhinestones. Hope you have enjoyed my first card and i will be back soon with more inspiration and ideas using Dreamees products. Hello lovelies, Nicola here today with a 'Sweet Variety' of projects! As Christmas is coming I knew I wouldn't have any time over the festive season to do any crafting so today I have made five projects for you all to see. I had a packet of flying saucers so I thought I would use the stamp to decorate the bag with. I have coloured using Letraset Flexmarkers in shades of: Muted Pink ~ Tea Rose ~ Dusky Pink ~ Blush ~ Pale Pink ~ Pale Citrus ~ Meadow Green ~ Sunflower ~ Soft Aqua ~ Watermelon ~ Honeydew ~ Amaranth Red. 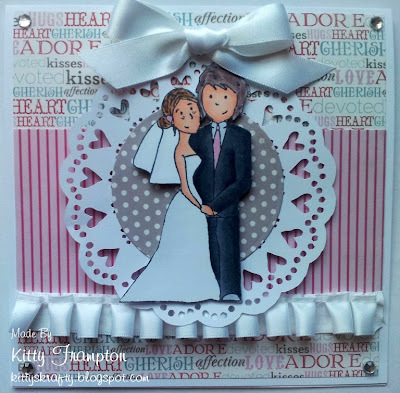 I have used a heart border punch and embellished with Card Candi. The next project I have used the MOSTLY MENS CD to make a birthday card for a wine lover. I am going to give this card to my brother-in-law for his birthday and he loves red wine so this is very fitting! The next three projects I have made Christmas Cards using the CHRISTMAS MEMORIES CD I have made two general Christmas cards using more or less the same elements apart from the ribbons are different. I have also made my husband's Christmas Card. I had some ribbons that I wanted to use from my own stash so I matched the colour scheme to the ribbons. I have also used some buttons on the easel card too that I had in my crafty stash! For the easel card I have used the Christmas tree topper and the text I have printed from my computer. I also added a PAPER DOILY WITH HEARTS and decorated it with Stickles glitter glue. I wanted to use the gingerbread and snowmen buttons that I had as they match the ribbons, papers and topper perfectly! I hope you have enjoyed looking at my crafty projects today. Don't forget to click on the links to see where you can buy the gorgeous Dreamees products. I hope you all have a lovely Christmas and a Very Happy New Year, don't forget to follow the Dreamees team in 2013 as there are lots of exciting times ahead! My name is Nicola Jayne Saul but all my crafty friends know me as NJ. I have been crafting for around 8 years now. I absolutely love what I do with a passion and look forward to sharing with you all my crafty makes using the gorgeous dreamees products. Carol and Hayley asked me to join their design team and I was so excited to accept. Such a lovely team, I know that 2013 will be a fantastic year for us so make sure you keep following everything the dreamees team will be bringing to you. ~ Remove the back from the frame and glass. Lay the frame on your craft sheet. Add drops of each alcohol ink to the felt on the blending tool. Work in sweeping motions to add colour to the frame. Add your colour to your taste as you go along, this is a very random technique. I built my colour up gradually by letting it dry, then adding more. ~ Colour the chipboard backing, you would normally add a photo to this, but I have used it to create the picture. ~ Using the clear pigment ink pad stamp the branch in the centre. ~ Using a brush, dust the pearl ex powder over the image and gently sweep over this with a larger brush. ~ Sit the ink pad over the image and spray the gold spray around this to create a sparkly border. Add dots of gold stickles. ~ Stamp the Poinsettia 20 times, colour in. Cut out. Spray them all with gold spray and attach to the frame as shown using Pinflair. ~ To finish add the Stickles Gold to the centres of the Poinsettia. I hope you like my first project for Dreamees. I think this makes a lovely Christmas Decoration with a difference. You have one week to enter for a chance to win some gorgeous dreamees goodies, so don't miss out! I am looking forward to a very exciting 2013 working with Carol and Hayley, so keep following our crafty journey and our crafty makes!